Use the JavaFX platform to create rich-client Java applications and discover how you can use this powerful Java-based UI platform, which is capable of handling large-scale data-driven business applications for PC as well as mobile and embedded devices. The expert authors cover the new more modular JavaFX 9 APIs, development tools, and best practices and provide code examples that explore the exciting new features provided with JavaFX 9, part of Oracle's new Java 9 release. 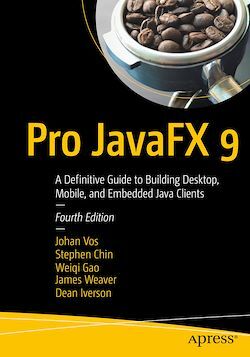 Pro JavaFX 9: A Definitive Guide to Building Desktop, Mobile, and Embedded Java Clients also contains engaging tutorials that cover virtually every facet of JavaFX development and reference materials on JavaFX that augment the JavaFX API documentation. Experienced Java programmers looking to learn and leverage JavaFX 9 for rich client-side Java development.